Image caption The BBC spoke to Carrie-Ann Lightley, William Peace and Ann Webster about strangers trying to push their wheelchairs. A tweet by a woman detailing how a stranger took control of her wheelchair has prompted other people to share similar stories and support. In the tweet Bronwyn Berg recounts how passers-by didn't intervene despite her "screaming for help". Ms Berg's tweet has received a huge reaction online, garnering nearly 65,000 likes and 20,000 retweets, with many people expressing their outrage and offering words of support, including Baroness Tanni Grey-Thompson. Ms Berg wrote on Twitter that she was "most upset that no one helped," adding "the way people looked away when I was calling for help makes me feel a lot less safe in the world". 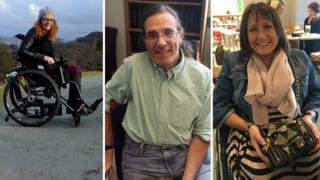 Many wheelchair users identified with the "horrifying" tweet, and were moved to share their experiences. Carrie-Ann Lightley runs a blog about accessible tourism and is used to travelling alone. She wasn't surprised when she read the tweet. "I thought it was awful, but I've had similar experiences," she told the BBC. Carrie-Ann says it is "dangerous" and "scary" when complete strangers come up behind her and touch her wheelchair without permission. "It makes me feel like society doesn't see me as an independent person, a young woman travelling, working and in a rush to get to places just like everyone else - they see me as someone who must be struggling." Some responded to Ms Berg's tweet to suggest that, while their actions may be misguided, people might just be trying to help. Carrie-Ann said that while "kindness makes the world a better place", she suggested people "always ask me before touching me or my wheelchair." Ann Webster was on her way home from work one evening when a man approached her and said "here hold these". "He thrust some rolled up newspapers on my knee and started to push me. "I kept saying no. I felt powerless." Ann remembers that while the stranger did eventually stop, he made it clear he thought Ann was "being horrible" for challenging his actions. "It's always been men who have attempted to push me," Ann said, "and yes I do feel vulnerable." Ann has recently developed a technique to "get back in control". "By spinning my chair around to face the offender, it shocks them into letting go," she said. William Peace told the BBC that when he challenges people who try to push his wheelchair without permission he is often told to "shut up and accept help" and accused of being "bitter". When he read Ms Berg's tweet, William said it made him think that "when people see a wheelchair that is exactly what they see - a wheelchair - not a human being". When asked why he thought passers-by didn't step in to assist Ms Berg he suggested that harassment against those with disabilities is not taken seriously. "I have been discriminated against my entire adult life and cannot think of any occasion when a typical bodied stranger offered to help," he said. "People with a disability are seen as 'less than', and often infantilised and assumed to be physically and mentally deficient." Ms Berg confirmed that, despite feeling "shaken up" by the experience, she was "okay".